LTHForum.com - New (or unheralded) kaiseki? LTH Home > Chat > Eating Out in Chicagoland > New (or unheralded) kaiseki? I'm looking to surprise the Lovely Dining Companion for her birthday and it occurred to me that we haven't done a great kaiseki meal in some time. So I spent some time looking through relatively recent posts but came up empty. We've had some wonderful kaiseki in Chicago over the years but I'm stumped when it comes to finding a new (or unheralded--or even simply overlooked) place. Any suggestions? (FWIW, something like the recently written-about Omakase Yume won't work because the LDC is not a raw seafood eater; on a few occasions she's had to have substitutes for those courses.) Thanks. Izakaya Mita has incredibly delicious non sushi stuff and creative specials and they're super nice - you might be able to arrange a birthday multi course menu? I'd call it omakase rather than kaiseki -- there are no kaiseki restaurants in Chicago. But I digress. Have you been to Oriole? That would be my choice. Incredible food, incredible service. Thanks all. As it happens, we've been to all three named places. My fondest recollection of a kaiseki meal here was Matsumoto, many years ago. I wrote it up for LTH and it remains here, somewhere. I do mean an "authentic" kaiseki, however, and I fear, as BR suggested, that there is no such animal around. Maybe there's a hole-in-the-wall in Arlington Heights (or somewhere else), but I suspect that I may have trouble locating one in Chicago. 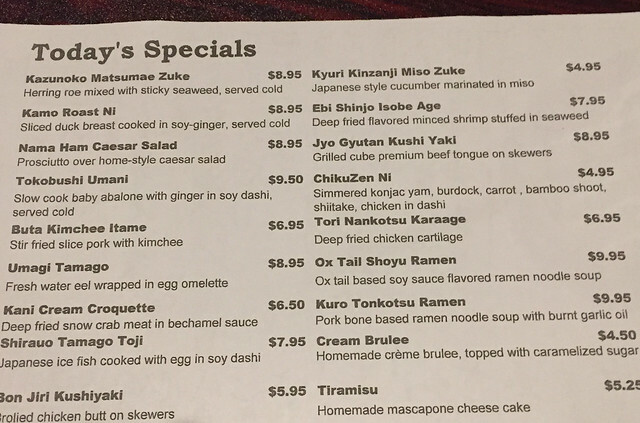 It's not kaiseki, but Daruma in Schaumburg has a daily specials menu with a lot of unique non-fish options. Here's a picture of the specials menu from about a year ago.